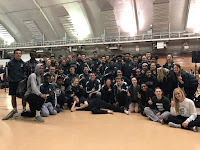 Tuesday night finally saw the long awaited start to the 2015 outdoor track & field campaign for the JMM Boys & Girls Track & Field teams. All athletes took to competition against Big 8 foes Beloit Memorial and Janesville Parker. For some athletes it was the first competition of the season while other continued to fine tune their race tactics for bigger meets yet to come. Many personal bests were set as the athletes took advantage of the beautiful early April weather. A reminder to all parents and athletes that we compete in Wisconsin and although the weather was nice Tuesday night we will still have cold weather, rain, and maybe even snow yet this season....so bring clothes to every meet for ALL weather conditions (& boy does it get colder when the sun goes down). In dual meet results the girls team fell to Beloit 73 to 59 and also loss to Parker 80 to 56. For the boys they beat Beloit 99 to 42 but loss to Parker 88 to 58. More important than dual meet wins are the PRs and improvements that we saw from many athletes. It is vital that each athlete learns from their performances and improves upon them from meet to meet, week to week, and as the season continues. Our big meet goals are still a month away and these dual meets are just stepping stones to performing well at the end of the season. Holly H in discus 131' 4" and shot put 35' 5 1/4"
Eli H in the discus - 120' 1"